Do you want to be an employer of choice? And want happy, productive, stable staff, that go the extra mile for their team and customers? This is the one number you need to know. The net promoter score is a simple metric of 1 - 10 that allows us to track how well we are doing with implementing our core values and our commitment to creating a great culture at work. Where does the Net Promoter Score come from and who uses it? The NPS is a metric developed by Fred Reichheld, Bain & Company and Satmetrix and was introduced in 2003 in a Harvard Business Review article titled "One Number You Need to Grow". 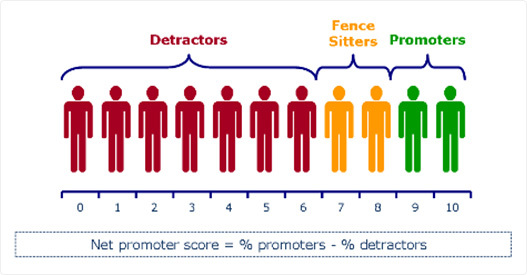 The NPS score can be as low as -100 (everybody is a detractor) or as high as +100 (everybody is a promoter). An NPS that is positive (i.e. higher than zero) is felt to be good, and an NPS of +50 is excellent. Discussed at length in Fred Reichheld's book "The Ultimate Question: Driving Good Profits and True Growth", the Net Promoter approach has been adopted by several companies, including Apple, American Express, eBay, Dell, Telstra and Virgin Australia. Those of us who are dissatisfied with their experience at work at the time of the survey. Those of us who are passively satisfied, however not overjoyed with their experience at work at the time of the survey. Those of us who believe their lives have been enriched by their experience at work at the time of the survey.